For the second installment of the Gringo Taco Showdown I decided to pit two Westside taco establishments against each other. Tacos Por Favor is pretty well known to anyone who eats tacos and lives on the Westside. Their chorizo and cheese taco with the spicy salsa roja never disappoints. The carne asada is above average as well. It’s the Westside so you’re going to pay more. Soft tacos are over $2 each and the hard shell taco I had was around $3.60 with tax. But generally everything at Tacos Por Favor is pretty good. Taco Plus however might be the blandest taqueria in all of LA. 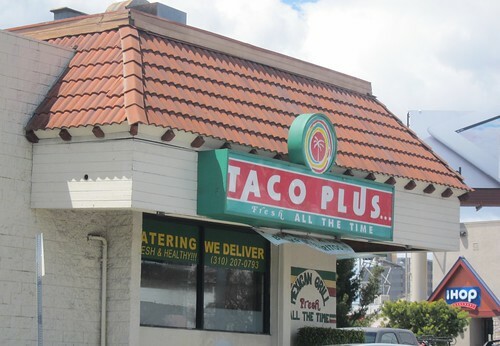 Now and then someone will tell me I need to try the tacos at Taco Plus. I can only gather that these people have never been east of La Brea if they think these are good tacos. Not to mention they are also around $2.25 a taco. The Tacos Por Favor hard shell taco came with carne asada which was suprising. I don’t think I’ve ever had a carne asada hard shell taco. It also came with pico de gallo, sour cream, and guacamole. The asada was fresh and seasoned well and the shell was nice and crispy. I’m not sure this taco falls into the gringo taco category. It’s not what I generally look for when I get that gringo taco urge and I probably wouldn’t order it again. But it was good for what it was. I was looking forward to the Taco Plus gringo taco. They even call it a gringo taco on their menu. 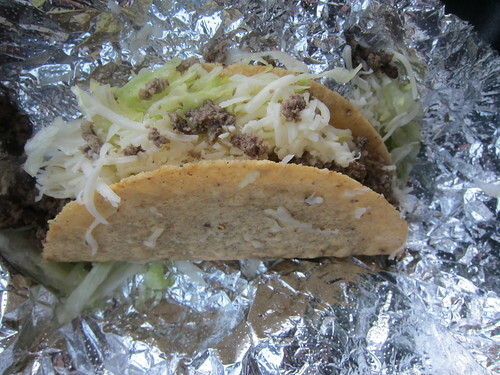 It comes with the three main ingredients associated with the gringo taco: ground beef, lettuce, and grated cheese. However, this may be the worst gringo taco I’ve ever had. The ground beef was cold, unseasoned, and tasted like it had been sitting around all afternoon. Sometimes for a treat I will cook up some ground beef for my dog. After draining the fat I’ll let it sit and cool for a bit and then spoon some in her dish. The beef has a very bland, beefy, unseasoned taste to it but she loves it. Well, that’s what this beef tasted like. My dog loved this taco but she doesn’t blog, I do. 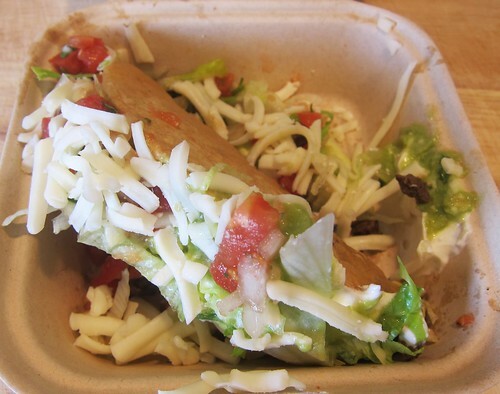 TPF's gringo taco is great, but way too expensive. That Taco Plus taco looked awful, but awfully cheap too. hope you covered it with salsa..
Why do you call them gringo tacos btw? Just to clarify, did you actually try any tacos at Taco Plus besides the Gringo? Because I frankly can't fathom anyone preferring the asada or al pastor at Pili's to Taco Plus. Pili's is the very definition of bland and mediocre. Then again, it's dirty and kind of sad, so maybe some people think it's somehow more "authentic," lol. yeah i had the asada, chicken, and al pastor. All were bland and over $2.50 per taco. Worst tacos in LA IMO when you also factor in price. In fairness, they're twice the size of many places. And while the chicken is indeed bland, I'm surprised the carne asada and al pastor weren't up to par. They must have been really off their game. I respect your opinion greatly, but these aren't the worst tacos in LA. Not by a long shot, imo. Couple of things regarding Tacos Por Favor. First, I assume you know they've opened a second location at Olympic and Bundy in the mini-mall with the Greek place? Second, speaking of Gringo food, have you tried the California burrito at TPF? I know you're a taco guy, but worth a try. They even use skinny fries like in San Diego. 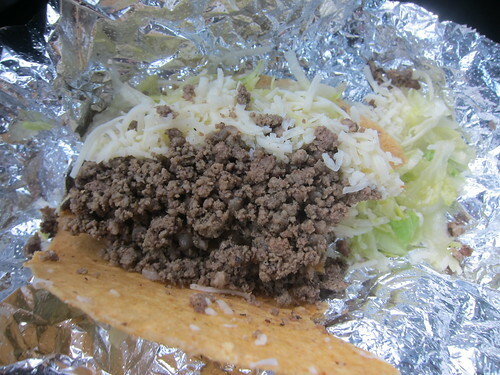 I would classify a hard shell asada taco as a gringo/hybrid. The Old Taco Bell in Texas? This place has what looks to be the ond Taco Lite, Taco Bell Grande, and what the enchirito used to look like. Even the burrito looks like the old burrito supreme that used to have black olives! Too bad I'll probably never make it out there. Bandini, I love your blog....it's one of my favorites, or perhaps my favorite because I love tacos and I used to live in the LA area a few years ago, now I live in Mexico and to my surprise.....the tacos here are not as good as the ones you can find there, but the gringo tacos as you call them....wwwwww, those tacos would not survive 1 minute here. Greetings and keep this amazing blog going.